Whilst the world is celebrating the 200th anniversary of the birth of Charlotte Brontë in 2016, there is a local connection with her which doesn’t seem to get a lot of notice. Charlotte’s father, Patrick Brontë, the Haworth Rector, was something of social activist. It is well documented that he put a lot of effort into trying to improve the lives of his parishioners. During the 1840’s you couldn’t get in the car or on the hopper bus to go places, you had to walk (unless you were one of the very lucky few who had a horse!) It was common for those who attended St Michael’s and All Angels in Haworth (Patrick’s church) to walk there 2 or 3 times on a Sunday. Those of Patrick’s flock who lived in Stanbury and the surrounding countryside would have gone through a lot of shoe leather! Patrick initiated the building of a ‘Misson Church / School’ in Stanbury in 1848, although with that being the year that both Branwell and Emily Bronte died, he would no doubt be preoccupied with the loss of his children. Patrick’s curate, Arthur Bell Nicholls, took a particular interest in the project and oversaw its building. 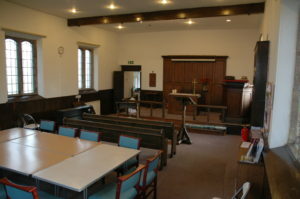 It is believed that Charlotte taught in the Sunday School at Stanbury Church and in 1854 (with the reluctant agreement of her father) she and Arthur Bell Nicholls were married. Who knows – perhaps love blossomed within the walls of Stanbury Church? In 1998 at the 150th anniversary of its completion, the Bishop of Bradford dedicated the church and it has since been known as St. Gabriel’s. A couple of years ago, we discovered that the wild Pennine weather the Brontë sisters wrote about had managed to penetrate the building causing some rot in the roof timbers. Our small congregation, together with friends and supporters are trying to raise an estimated £45,000 so that we do not lose this little piece of history. If you would like to help us, then keep an eye out for social and fundraising events at St. Gabriel’s and support them if you can.